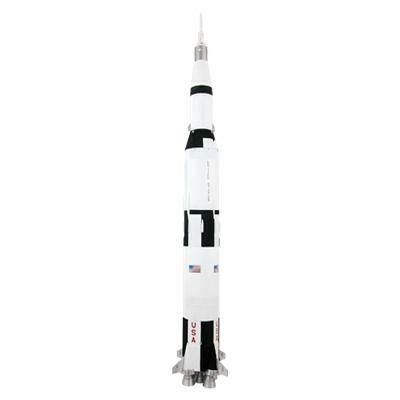 Once again, Estes has brought back the famous Saturn V! This rocket was the first vehicle to send man to the moon and this is one of the finest 1:100th scale models kits ever produced. Scaled from official NASA drawings, the finished model is 43.25 inches tall and lifts off to about 350 feet on a E30-4 composite motor. Every plastic part in this kit has been updated! Accurate Apollo II body wraps, detailed blow molded transition, easier to assemble escape tower, injection molded fins and highly detailed removable display nozzles that doubles as a stand. Included is a "bonus" plastic model of the Lunar Module! Electronic launch system (capable of igniting a composite engine); launch pad with 3/16" rod; recovery wadding; engines (see list of recommended engines above).